Founded in 1860, Swiss luxury maison Chopard is internationally renowned for its innovative jewellery and timepiece collections. The family-owned company has built its reputation on iconic ladies collections such as Happy Diamonds and Happy Sport, celebrating its 25th Anniversary this year. 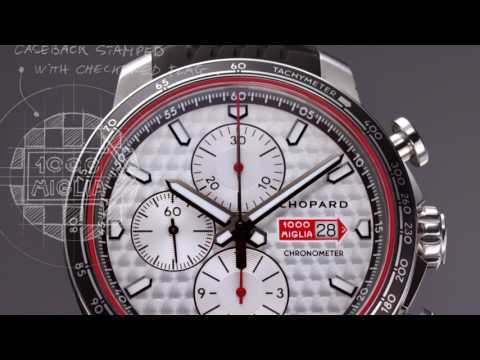 Chopard is also the proud official timekeeper and sponsor of legendary Mille Miglia and Grand Prix de Monaco Historique classic car races, inspiring the high-powered designs of the Classic Racing men's watch creations. Chopard stands for passion for excellence, reflected in its collection of exceptional ladies and gents timepieces. The Classic Racing range represents the bridge between automotive engineering and mechanical watchmaking. The Happy Sport collection has become iconic combining precious stones and diamonds with stainless steel in an infinite amount of variations. IMPERIALE, Chopard's most feminine watch collection, is unique through its sculptural lines and the refinement of details. The maison's jewellery creations are timeless, playful and express quality and creativity. Playfulness is expressed through the Happy Diamonds collection with the moving diamonds gently dancing and twirling, timelessness is portrayed in the majestic elegance of the IMPERIALE creations.